 Love TO: Extend love to particular people, to all beings, or to God.  Intend: Make loving your wholehearted purpose.  Feel: Use feeling as your method of tuning to the vibration of love.  Radiate: Send love spherically, in all directions. 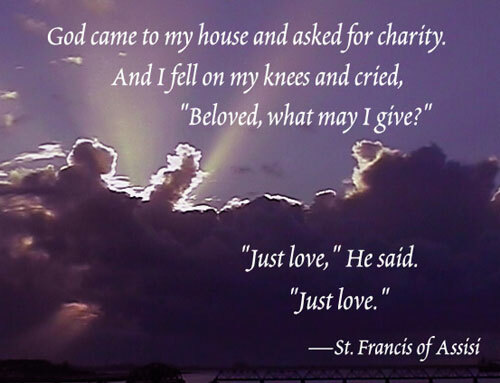 What to do: Simply love. Start by simply loving. Love as you presently know love to be, from your own experience of loving. You might feel outward AND inward with love. You might extend blessings, affinity, care, energy, to people you know, or to the world, or to God, or to any combination of these. Or you might simply love with no particular object. No matter how you love and where you direct your love -- or whether you JUST love, WITHOUT directing your love to any particular "destination" -- the important thing is to love sincerely, and feel it truly. Get in touch with love, and love with your whole heart and mind. As you do this, you will feel your spirit rising up, and your body filling with the power of love. Why not start with the universal form of love, and skip all objects of love completely?